It does not matter if you are new school, old school or homeschool ALL teachers love this teaching kit. Look at all of the items in the Teaching Kit! This kit has all of the Off-Kilta Matilda™ products in one handy-dandy tote. It does not matter if you are new school, old school or homeschool ALL teachers love this fun teaching kit. We wanted to keep this easy, we know that teachers have a lot of work to do - so we put everything in one place. The teaching kit contains, the Off-Kilta Matilda™ plush, the Off-Kilta Matilda™ book, stickers (6), bookmarks (2), pencils (3) and has a handy tote that you can carry from class to class. In addition, every kit grants you (and your classroom) access to our Prime Number Club™. Enter the code from your book into our website and you will get access to printables, our teaching guide, coloring sheets and classroom activities that will make your life STEMtastic! Check out this adorable plush! 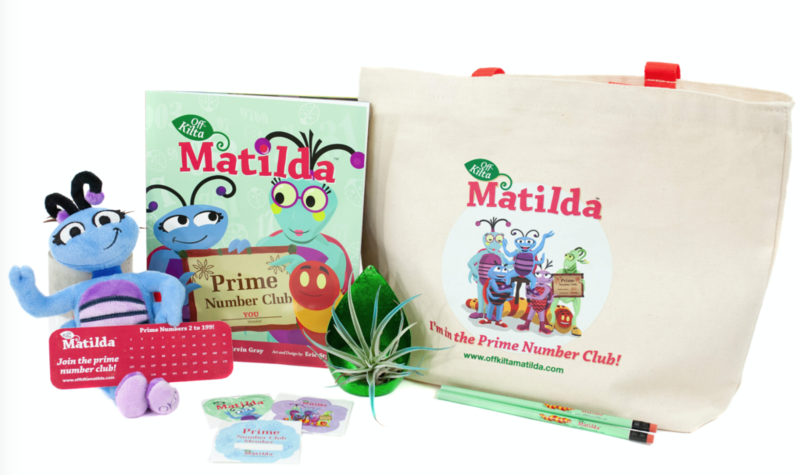 Get the teaching kit today and join the Prime Number Club! Why buy all of the Off-Kilta Matilda products separately when you can get it all in one place. We also have the kits discounted. Separately the items would cost $42.00 - we are selling our Teaching Kits for $37.00!